Manufacturer of a wide range of products which include pay off stand and pay off stand for wire drawing machine. With the help of our experienced workforce, we are able to present a durable range of Pay Off Stand to our deemed clients. 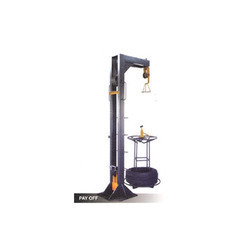 These stands are manufactured with utmost precision by making use of prime grade raw material by means of updated machines and advent technology. Offered stands are fabricated in sync with the industry laid standards and norms that helps us to deliver a defect free range at the clients end within the postulated time frame as per their needs and demands.